Since my last post about the power of 48 minutes, I’ve been testing different combinations of focused work time. I’ve tried 40, 45, 48, and 50 minute intervals and they all work well for long projects. The main consideration is having a good work area, some kind of timer, and a beverage warmer for coffee or tea. The ability to focus for a straight period of time is dependent on keeping the distractions to a minimum. When all of these things are in place my productivity soars. A large project is pretty easy to focus on. 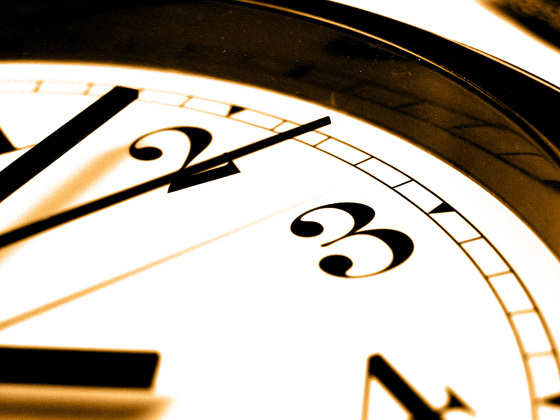 If I’m writing a blog post for instance, the 50 minute time period works great. I just keep writing and keep an eye on the timer. When I have about 10 minutes to go, I know I need to wrap it up and upload the post. But what about smaller tasks? Is there a way to combine multiple ones into a focused time period? I took a look at some of the outlining and organizing strategies that I’ve used before. I thought to myself, “There needs to be a way to organize tasks by time and combine them into a optimized focus time.” I tried a couple of things using the walleteer cards that I usually carry with me. I listed a smaller task on one of them and jotted down a reasonable completion time. I did this with multiple cards and did an experiment. I set aside a time period of 50 minutes as it was easily dividable. I laid the cards out on the table and took a marker and marked a large number on each one of how much time I thought it would take to complete the task. I had two 15 minute cards and two 10 minute cards. I set the timer for 50 minutes and took the first 15 minute card out of the stack. I started working on the task (sending an e-mail) and I noticed right away the urgency to get the task done. I would glance at the timer from time to time. I finished up the correspondence in the allotted time. There was something about being timed that kept me on track. E-mails have a way of being huge time hogs for me as my constant revisions really eat up time. With a timed focus I wrote faster, did one final spell check, and then send. I pulled out the next card which was another 15 minute card. This one was a reply to a blog post. I started writing and found that this whole experience was like a game. I glanced at the timer and kept writing. The words came much easier now that I had a deadline. Short and concise was the name of the game. I finished the reply and clicked send. On to the next card. The next task was to change the text on a computer graphic in 10 minutes. I fired up Photoshop, loaded the graphic, changed the text, and saved the file. I had the urge to mess around with the file but time contraints kept me focused. I uploaded the finished file to the webserver and then took up the last 10 minute card. This one involved burning a CD for work. I opened Nero, put in a blank CD, copied the files, and clicked burn. It seemed to take forever to get going. I couldn’t help watching the timer. I was at the mercy of this software… come on… burn… faster… faster. It was like watching a Nascar Race. Would Nero make it on time? The finish line was fast approaching as the timer clicked down… but Nero came through at 48x. I ejected the disk with a minute to spare. This was fun and I can say that any one of the individual tasks could have easily eaten up 50 minutes. There was some amazing competitive power in these cards. I decided to design some card sets in Word with the minutes watermarked into the background. 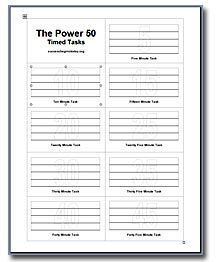 Two 50 minute periods produced three sets of cards that I can use for most any task. I would like to share these with you. The first set has 9 cards from 5 minutes to 45 minutes. The second is a sheet of all 5 minute cards and the last is all 10 minute cards. These are easily printed on normal Avery business card stock. The cards are ideal for similar tasks in one area. I find that grouping activities by computer, phone calls, and task items works well for me. Sales people and others who must make a lot of phone calls or send multiple e-mails may find the 5 and 10 minute cards very helpful. 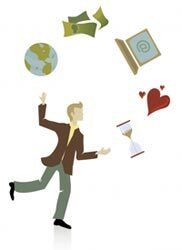 I read a fascinating blog post today by Kathy Sierra of Creating Passionate Users on multitasking. The main point being that multitasking is a misnomer. It doesn’t make you more efficient… it actually slows you down. I agree with Kathy on the basic principle. I find myself having to deal with multiple tasks all the time. Kathy explains..
Our brains can’t do even two independent things that require conscious thought, especially if those two things involve different goals. But that’s OK, you might think, since multi-threaded systems on a single-processor aren’t technically doing two things at the same time.. they’re simply switching back and forth so quickly that they just appear to be processing simultaneously. But that’s the problem… the brain isn’t a computer, and in many cases the brain works much more slowly than a modern processor. I find that when I can concentrate on one task at a time that I’m much less stressed and much more focused. The quality of my work is better and I usually am able to fully complete the task. The key thing is trying to use the same part of the brain at the same time. But that’s not to say that all multi-tasking is bad. I’ve discovered a multitasking trick that has revolutionized my learning ability and helps me be more efficient when doing mundane tasks. This trick is so amazing that I have a hard time believing that it works. I realized it quite by accident over the last few months. I started noticing that I could concentrate on educational audio books better when I was listening while walking, running, or driving in my car. If I just sat in a chair and listened I would have a much harder time concentrating and soon found myself fidgeting or falling asleep. This has had amazing ramifications for me. I’ve discovered that I’m a Kinesthetic (Hands On) learner and that I learn best when I’m doing something with my hands or when I’m up and walking about. In school I could learn things so much better if I could do them hands on. This ability to do two things at once has changed my life. The key here is doing two things that use different parts of the brain. It used to be that if I wanted to learn something, I would read a book. With my busy schedule trying to find the time to read on a consistent basis has been difficult to say the least. I have many books that were started with great intentions but have not been finished. I find myself trying to read in the evenings when I’m tired and it usually ends up with sleep overtaking the reading process. With Audio books on my iPod I can listen while driving or exercising. I have listened to over 30 Audio Books in the last year and I can honestly say that I’ve finished all but one (and that one had such bad narration I don’t think many people could get through it). Some of the better ones I have listened to multiple times. My comprehension of the material is much better than when I try to sit and read. If the material is fact intensive, I find it helpful to pick up the written book for reference and outline the material by hand. If you are a kinesthetic or auditory learner I highly recommend that you give audio books a try. Load one up on a iPod or other MP3 player and take a walk or a short drive. I think like me you’ll find a whole new world of learning at your fingertips. The 30 audio books that I listened to had an average length of four hours. With standard written books this 120 hours of reading would take three weeks of 8 hour days to accomplish. I listened to all 30 of these books while sitting in traffic, driving to work, or out on my daily walks. For most people this is totally unproductive time. For me I’ve discovered that my car and my walks have became a classroom! Question: What multitasking tricks have you learned? Develop one new habit a month for a year. That has been my quest since October of 2005. As I come into the fifth month of my twelve month quest I have decided to bring in the exercise quotient. I want to develop a “doable” exercise program that is easy to track and record. To do 30 minutes of exercise a day. This is an interesting goal for the fact that it has a time requirement in it. I have to find 30 minutes out of my 24 hour day to exercise. I have to replace an existing activity with physical activity. This is the tricky part… what 30 minute section of my day can I set aside for this new activity? As I wrote about in Quadraphasic Living there are distinct advantages to exercising first thing in the morning. Studies suggest that exercising before eating anything in the morning can burn 300% more calories than exercising later in the day. I definitely like the idea of being efficient but the early morning hours present a problem for me. That shouldn’t be a problem… right? But the morning is “my” time. It’s a time to write, design, and do creative things. On most days this time is limited to the hours between waking and going to work. I usually get up at 5am and need to get ready for work by 6:30. Ninety minutes is actually a pretty short time and to take a 30 minute chunk out of it will just not work. Exercise at a different time of the day and be less efficient. So far the second option has been the one that has worked for me but the first option is definitely the preferred one. Can I replace 30 minutes of “sleep” with exercise… time will tell. My wife and I are going to “turn back the clock” on our alarm and see what happens. The other habits are going well. January 2006: Write One New Blog Article A Week. The first three habits have become automatic on workdays which is amazing to me. I have modified the November goal to include breakfast and the December goal to include two pieces of fruit a day. Modifying these goals was easier than starting a new one. Both took additional planning and shopping but were relatively easy to modify. For many people these probably sound easy but they have always eluded me in the past. To consistently walk out of the house in the morning with lunch, two pieces of fruit and a liter bottle of water has been very encouraging. Do NOT stop until that time. This process is amazing. The timer is the key and I find the ideas come quickly. Next time you have writers block try this technique. With this procedure I have numerous articles ‘in process”. With the weekend coming I should be able to find the large block of time and be able to put it all together. If you have any trick or tips in the writing process please leave a comment. I would love to hear your ideas to make this “writing habit” an easier one. Dwayne Melancon over at Genuine Curiosity has a post today about his “love it and hate it” attitude to David Allen’s Getting Things Done time management system. As a long-time Getting Things Done (GTD) follower, I love it and I hate it. I love it because it’s simple, powerful, and flexible. I hate it because it’s too flexible. I’ve had a hard time getting a specific workflow down and sticking to it. GTD doesn’t have rigid “props” for me to use as mental queues like many other systems (with the Franklin-Covey systems, you can “ground yourself” to the daily task list – with GTD, there are a number of lists). Part of my new year reset is to try to streamline my use of GTD and establish better rituals to help me keep up a consistent approach to evaluating my choices, scheduling, etc. (if you’ve visited here in the past, you’ll know that this sort of thing is a recurring theme for me – I’m a bit of a GTD binge user). If you have experiences or resources that have helped you create a set of daily habits for GTD, please let me know. As an avid fan of David Allen’s “Getting Things Done” process, I’ve found some tweaks that make it much more useful for tech work. When I first read David’s book I spent two days going thru my 1100 e-mails and overfull inbox. I purchased his Outlook plug-in and converted e-mails to projects. This was amazing to say the least. I now have a manageable in-box and a great project list. With David’s technique of identifying the “next action step” and his GTD Outlook software I am able to sort action steps by area (phone calls, computer, errands, etc). This has really helped identify the steps but it can lead to doing a lot of little things and not really “accomplishing” anything. With some trial and error the following procedure has evolved that helps me stay on track much better. Action Steps are the individual steps to complete the project. To complete my process I use a “Hipster PDA” from the 43folders website as a place to list and mark-off accomplishments. My daily ritual consists of perusing my projects list and coming up with milestones or “accomplishments” that can be done in a day. I ask the question “What is the Next Accomplishment?” I list the accomplishment at the top of an index card and then numerically list the next action steps down the card. I post the card prominently on my desk or work area so I am reminded of the “action steps”. I check off the individual steps as they are completed. When I go from place to place, it’s easy to put the card(s) back in my hipster and take them with me. I have found that adding the extra category of “accomplishments” has really helped me focus on getting something tangible done everyday. This process still works well for me a year later. I find a standard desk pad also works well for the “accomplishment’s list” and is a nice place for notes. When I’m done for the day I can open the GTD software in Outlook and update my project lists in a matter of minutes and print out a new list for the next day. The real secret to fully implementing the GTD system is to try different things and see what works for you. It’s a simple yet incredibly powerful system for time management.